never repeat the sins of the past! But ignoring knowledge that could save lives?? Remnants of humankind survived the asteroid hitting Earth, rebuilt their world over thousands of years without the evils of technology, yet some people are seeking out and using forbidden knowledge! After their parents are killed, older brother Clive vows that the heretic attackers must die. Studying at the seat of all wisdom, younger brother Clover sees that technology is not purely evil. The precarious power balance between church and military is shifting, but both want technology-users wiped out! Look for Strange Fire at your local library or independent bookstore, and also check for Wallach’s earlier book, We All Looked Up , about a community waiting for the asteroid heading for Earth…very soon. How do we balance technology overload with being truly alive? Book info: Strange Fire (The Anchor & Sophia, book 1) / Tommy Wallach. Simon & Schuster Books for Young Readers, 2017. [author site] [publisher site] Review copy and cover image courtesy of the publisher. My book talk: Their family attacked by heretical rebels, teen brothers Clive and Clover must decide how – or whether – to fight back in their technology-averse society. After sky-filling lightning devastated the world, its few survivors vowed to erase technology and never repeat the past’s mistakes, for their safety and their future. Preaching this Descendancy gospel has been the Hamill family’s life work – and may destroy them when they discover a remote settlement purposely experimenting with forbidden science. Clive knows technology is blasphemy and that long-adored Gemma will help soldiers from the Anchor find the rebels. Clover wants to learn everything and begins to question the Descendancy’s stranglehold on knowledge. When technology is blasphemy, can new ideas ever be accepted? Is it right to keep the people of the Descendancy in ignorance? What is truth? What is right? Who gets to decide? This first book in The Anchor and Sophia series pits the power of the status quo against the struggle of knowledge to be free. Hurricane Katrina proves her unwise! This fictional account of one family’s struggles to survive Katrina’s fury, then be reunited after their rescue has been heralded as true-to-life and as frightening as reality by people in the Ninth Ward who were also there during the devastating hurricane. Recent Hurricanes Harvey, Irma, and Maria spread similar destruction and disruption – be ready for more hurricanes hitting unusual locations. But have we really learned from these disasters? Book info: Hurricane Boy / Laura Roach Dragon. Pelican Publishing, 2014. [author site] [publisher site] Review copy and cover image courtesy of the publisher. My book talk: When their Ninth Ward home is swept away by Hurricane Katrina, Hollis and his younger siblings are separated from big brother Jonas and grandma Gee during the evacuation – will they be able to find each other and get back to New Orleans? Good thing that Gee had an axe in the attic so they could escape through the roof when the levee broke and flooded the house. Lucky that rescuers could read ‘insulin’ painted on the roof and save her after the long first days with no drinking water. Most unfortunate that Jonas had swum over to help others when Hollis, Leta, and Augie are finally taken to safety – far, far from home! As Augie refuses unfamiliar food at the shelter, Hollis deals with people trying to take advantage of the three siblings and other kids separated from their parents, all the while wondering why his dad abandoned the family as mom died of cancer and whether he even survived the hurricane. Kyle can’t unsee the Twin Towers falling on 9/11, can’t unrescue the ash-covered girl with costume wings and no memory, can’t unwish that she would stay with him as he cares for paralyzed Uncle Matt while Mom is stuck in LA with his little sister and Dad is at Ground Zero with his police squad and other rescue workers. You can find this September 2016 release at your local library or independent bookstore to meet Kyle and Uncle Matt and the jagged-hair girl with wings. What things have the most weight in your own memories? Book info: The Memory of Things / Gae Polisner. St. Martin’s Griffin, 2016. [author site] [publisher site] Review copy and cover image courtesy of the publisher. My book talk: Rushing across the Brooklyn Bridge on 9/11, Kyle spots a girl wearing wings, covered with ashes, poised to jump? Safely home, the 16-year-old finds that the girl can’t remember her name, he can’t get his dad in downtown New York City on the phone, his mom and sister can’t get home from LA, and paralyzed Uncle Matt’s caregiver can’t get to his family’s apartment. What can Kyle do but help Uncle Matt, keep trying to contact Dad, and wonder if the girl will get her memory back? Stories of seagoing survival to read with your ears! Time to download this week’s free audiobooks from SYNC so you can read with your ears! 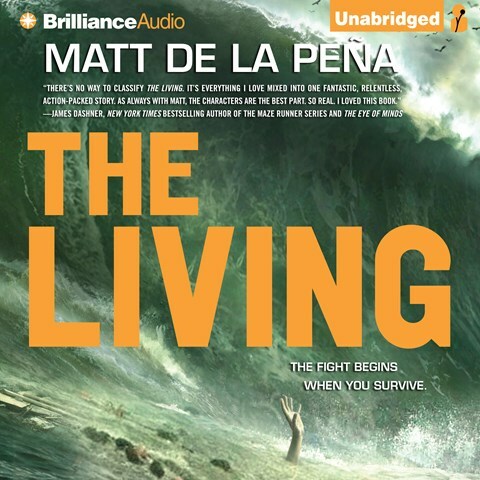 Click on the title to download each audiobook by Wednesday – free and easy. After an earthquake wrecks the cruise ship he’s working on, Shy must survive and keep a rich teen girl alive, too. The crew of a small fishing boat battles against the storm of the century. Two amazing survival stories – have you read either of these in print? As tornado season revs up in the Midwest and South, please be sure that your family has disaster plan in place for the likely perils in your area, including the part that Jersey’s family forgot – where to meet up when the all-clear sounds. You’ll find this sad-but-hopeful 2014 book at your local library or independent bookstore with Jennifer Brown’s other strong books about teens in difficult situations. Got a disaster story to share? 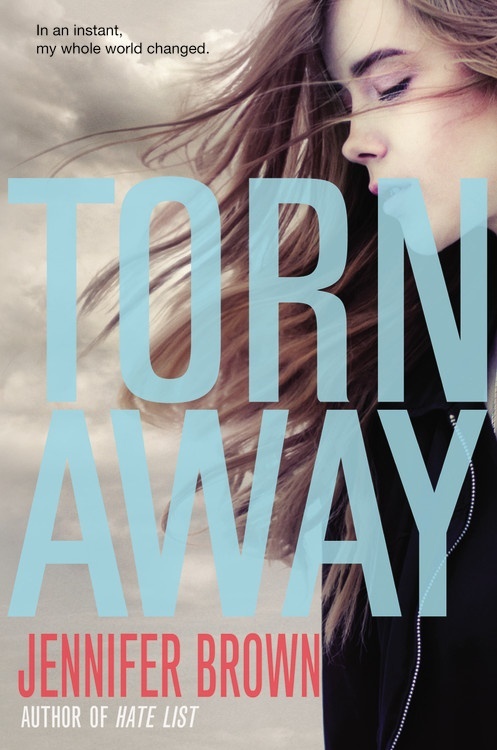 Book info: Torn Away / Jennifer Brown. Little Brown Books for Young Readers, 2014. [author site] [publisher site] Review copy and cover image courtesy of the publisher. My book talk: As she is shuffled from her estranged dad’s house to the grandparents she never knew, Jersey regrets her harsh words to Mom and little sister on the day that a tornado swept them away. Jersey did go into the basement when the warning sirens began, but couldn’t imagine that the tornado would really touch down in her Missouri neighborhood – or crush the dance studio with Mom and five-year-old Marin in it. Stashing tiny notes about what her mom and half-sister liked best in the old purse Marin loved, trying not to make problems for dad’s extended family who’d very grudgingly taken her in, things go from bad to terrible for the high school junior, and Jersey is forced to meet Mom’s parents who disowned her when she married. How can she catch her fading memories of Marin and Mom? Why don’t any of the relatives’ stories line up with what Mom told her? Will anything ever feel right again?